56 Commercial Real Estate & Properties in East Brisbane are listed in 8 categories. We have 19 OfficesSale & Lease , 16 Industrial Warehouses Sale & Lease , 10 Other Commercial PropertiesSale & Lease , 10 Retail ShopsSale & Lease , 1 Hotels and LeisureSale & Lease and 1 ShowroomsSale & Lease . 43m2 ground floor office 1 Car park plus shared customer parking Close to the CBD Public transport services close by Located less than 4 kilometres from Brisbane’s CBD, East Brisbane is a tightly contested precinct for all categories of property. This south eastern fringe location offers immediate access to the M3 Pacific Motorway, walking distance to train and bus stations as well as being less than 2 kilometres to the Greenslopes Private hospital. Specifically to commercial property, this is a strategic business location and highly sought after. 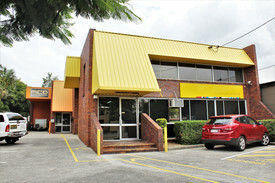 Ray White Commercial Northern Corridor Group is pleased to offer for Lease Shop 1 45 Wellington St East Brisbane. 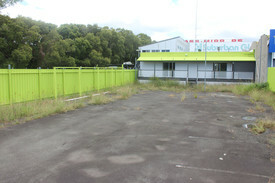 This Brand New 164m2 Showroom features: Open format high with ceiling catering for most users Prime corner position for added exposure Full perimeter glass shopfront Suiting but not limited to food, fitness studio, medical Shops from 84m2 also available Vibrant surrounding tenant mix including: food, medical, martial arts Located within East Brisbane's developing precinct approximately 5 kilometres from the CBD. The property provides good access to all arterial roads. For further information please contact Juma Marstella on 0450 360 321. 80sqm 249sqm air conditioned ground floor office/ showroom CCTV surveillance system Ample 3 phase power supply available if required Male female amenities, showers kitchenette Staff breakout/ bbq area at rear Rare opportunity in the highly sough after city fringe Solar panels installed Close proximity to public transport local cafes/ restaurants Exciting transforming neighbourhood Lease Price 249sqm : $280/sqm + GST Gross Smaller Space: $330/sqm + GST Gross Sizes subject to final survey ( approx.) For further information or to arrange an inspection please contact the exclusive marketing agents Jack Gwyn or Jared Doyle of Ray White Commercial TradeCoast! Features: Functional office space spanning over 2 levels Open plan area located on level 1 Reception area on ground floor Kitchenette amenities Close proximity to public transport For further information, or to book an inspection, please contact the marketing agents at Ray White Commercial (QLD). 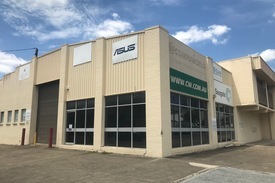 1073m² of air conditioned showroom and warehouse space with option to split Flexible tenancy options ranging from 236m² 1,073m² Excellent car parking onsite (secure) / street parking Massive exposure to Wellington Road – 45 metre frontage Current Liquor Licence (STCA) Rear access and loading dock Large residential development in the surrounding area Significant main road exposure Minutes to the CBD and neighbouring the "GABBA" Suitable for a wide variety of users including events venue, bar/restaurant, gym, retail, showroom, small format supermarket, medical (STCA) The building is located on the corner of Wellington Road and Nile Street within the suburb of East Brisbane, approximately 2.5 kilometres east of the Brisbane CBD. 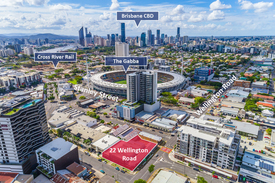 Within 500 metres east of the subject property is the World Famous Gabba Stadium, Woolloongabba Antiques precinct, Gabba Central a popular shopping centre anchored by Coles supermarket and the under construction Cross River Rail. 22 Wellington Road provides the opportunity to secure a long term lease within this rapidly growing inner city precinct. Please contact Gavin Moore on 0422 222 978 or Nina Brailey on 0415 387 727 your exclusive agents from McGees Property to schedule your inspection. Central Location | Natural Light | Fully Furnished $440pw | 8 Person Workspa..
PROPERTY OVERVIEW $440pw Price incl. Located in the heart of East Brisbane this flexible and short term workspace has 9 private offices to rent as well as coworking desks. The fit out is brand new and every room comes fully furnished with desks, chairs and storage. There is shared use of the meeting rooms and you can rent each space on flexible terms by the month or year. This boutique serviced office is a great extension to your business as they offer support services from mail collection to printing assistance, on site catering, meeting room set up and more This is a newly refurbished low level workspace is spread over two floors. The building has been designed with a focus on creating a light and modern internal working environment. Paid parking within the building is offered and there is free car parking on the street outside. The advertised office space is perfect for a team of 8. If you need more or less space, we have over 30,000 furnished workspaces all over the world suitable for a team of 1 to 200+. Our award winning team offer a free service that will help you find the perfect solution for your needs, so reach out if you need more help. What you get for your weekly rent , 24/7 Security , Access to kitchen facilities , Building outgoings included , Electricity and internet usage included , Regular cleaning , Dedicated IT and communications support , Fully equipped boardrooms, meeting rooms and day offices (fees may apply) , Access to secure printer and scanner , Flexible lease , Plug and play furnished workspace , Lockable storage unit Building features , Air conditioning , Bike racks , Disabled facilities , Ground floor security , Natural light , Professional environment , Showers , Direct access to public transport , Gym and fitness centre close by , Impressive new fit out 150m to IGA East Brisbane 100m to Raymond Park and 170m to Mowbray Park 630m to the Gabba Sports Ground 2km from the CBD and 10 minutes from the Brisbane Airport 430m to the following bus stops 230,235 and N226 Who is Office Hub? Office Hub is the world\'s No.1 marketplace for office space. We have a huge global selection of coworking spaces, serviced offices and shared office spaces with flexible options to suit teams from 1 200 people. We\'ll take you on a tour of all the workspaces that fit your needs and work on your behalf to get the best price possible. We\'ll help you discover how shared office space can be the most beneficial and budget friendly solution for your business. www.office hub.com Conditions apply – the advertised price includes any incentives offered based on a 12 month agreement and is available to new tenants only. Please note that the rental rate may increase for a shorter rental period. A portion of the square meterage factors in access to shared space. Take advantage of this property's main road exposure and let your business be seen. Featuring 300 m2 of retail/showroom/office space this newly refurbished property offers great signage opportunities, and boasts 13 exclusive use car parking bays. Tenancies available; 300 m2 132 m2 Two tenancies available at 84 m2 Features: Open plan design Brand new bathroom amenities Fully equipped kitchen Air conditioning Huge signage opportunities 13 exclusive use car parks For more information or to book an inspection contact your Blocksidge Agents today. 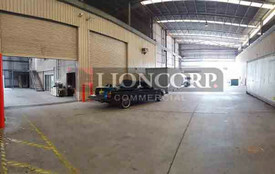 460sqm office/ showroom/ warehouse 249sqm air conditioned ground floor office/ showroom 211sqm warehouse CCTV surveillance system Electric container height roller door Ample 3 phase power supply Up to 6m internal warehouse height 5 car parks included in advertised price Additional 3 tandem bays/ hardstand could be included for additional rent Dual crossover access allowing functional vehicle maneuverability container set down areas (if required) Male female amenities, showers kitchenette Staff breakout/ bbq area at rear Rare opportunity in the highly sough after city fringe Close proximity to public transport local cafes/ restaurants Exciting transforming neighbourhood Lease Price: $96,600 p/a + GST Gross ( approx.) For further information or to arrange an inspection please contact the exclusive marketing agents Jack Gwyn or Jared Doyle of Ray White Commercial TradeCoast! 46 sqm functional office Located first floor Close to Woolloongabba Regular bus service from nearby Stanley Street Ideal for servicing the City This office plus the adjoining 284 sqm warehouse option available Located less than 4 kilometres from Brisbane’s CBD, East Brisbane is a tightly contested precinct for all categories of property. This south eastern fringe location offers immediate access to the M3 Pacific Motorway, walking distance to train and bus stations as well as being less than 2 kilometres to the Greenslopes Private hospital. Specifically to commercial property, this is a strategic business location and highly sought after. 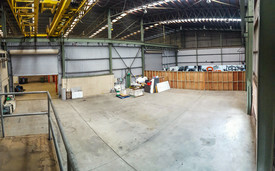 247m2 clear span warehouse/workshop Semi trailer access with loading under cover 3 phase power Good onsite parking Close to the CBD and Woolloongabba Ideal for servicing the city Regular bus services from nearby Stanley St Located less than 4 kilometres from Brisbane’s CBD, East Brisbane is a tightly contested precinct for all categories of property. This south eastern fringe location offers immediate access to the M3 Pacific Motorway, walking distance to train and bus stations as well as being less than 2 kilometres to the Greenslopes Private hospital. Specifically to commercial property, this is a strategic business location and highly sought after. 247m2 clear span warehouse with 46m2 functional office Yard area offers enough space to drop container undercover adjacent Semi trailer access with loading undercover 3 phase power Good onsite parking Regular bus service from nearby Stanley Street Close to the CBD, ideal for servicing the city Warehouse only option available Located less than 4 kilometres from Brisbane’s CBD, East Brisbane is a tightly contested precinct for all categories of property. This south eastern fringe location offers immediate access to the M3 Pacific Motorway, walking distance to train and bus stations as well as being less than 2 kilometres to the Greenslopes Private hospital. Specifically to commercial property, this is a strategic business location and highly sought after. 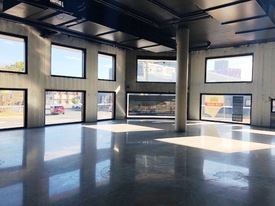 300sqm office/ showroom/ warehouse 3 phase power available 5 exclusive use car spaces Existing fit out could be utilised, altered or refurbished Kitchenette, male female amenities Highly exposed to busy Stanley Street E Great access to local cafes, Public Transport, Brisbane CBD etc. Lease Price: $75,000 p/a + GST Gross ( approx.) 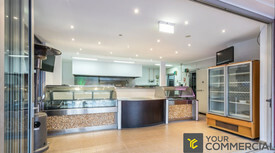 For further information or to arrange an inspection please contact the marketing agents Jack Gwyn or Jared Doyle of Ray White Commercial TradeCoast! 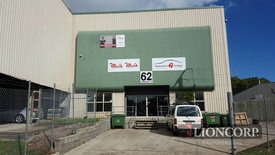 622sqm office/ showroom/ warehouse on a 1,060sqm rectangular site 200sqm warehouse (could be increased if office removed) 422sqm office/ showroom 3 phase power available 3 container height roller doors 13 exclusive use car spaces Rear yard accessed via Biggs Street which could be used as 116sqm hardstand Existing fit out could be utilised, altered or refurbished Kitchenettes, male female amenities Highly exposed to busy Stanley Street E Great access to local cafes, Public Transport, Brisbane CBD etc. Lease Price: $142,500 p/a + GST Gross ( approx.) 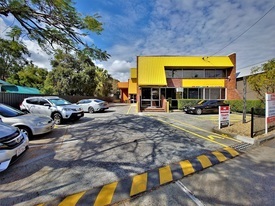 For further information or to arrange an inspection please contact the marketing agents Jack Gwyn or Jared Doyle of Ray White Commercial TradeCoast! Bike Racks & Showers | Professional Space | Natural Light $341pw | 4 Person Workspa..
PROPERTY OVERVIEW $341pw Price incl. Located in the heart of East Brisbane this flexible and short term workspace has 9 private offices to rent as well as coworking desks. The fit out is brand new and every room comes fully furnished with desks, chairs and storage. There is shared use of the meeting rooms and you can rent each space on flexible terms by the month or year. This boutique serviced office is a great extension to your business as they offer support services from mail collection to printing assistance, on site catering, meeting room set up and more This is a newly refurbished low level workspace is spread over two floors. The building has been designed with a focus on creating a light and modern internal working environment. Paid parking within the building is offered and there is free car parking on the street outside. The advertised office space is perfect for a team of 4. If that\'s not quite right, we have ready to use workspaces of all sizes all over the world and our free service will help you find the perfect solution for your needs. What you get for your weekly rent , 24/7 Security , Access to kitchen facilities , Building outgoings included , Electricity and internet usage included , Regular cleaning , Dedicated IT and communications support , Fully equipped boardrooms, meeting rooms and day offices (fees may apply) , Access to secure printer and scanner , Flexible lease , Plug and play furnished workspace , Lockable storage unit Building features , Air conditioning , Bike racks , Disabled facilities , Ground floor security , Natural light , Professional environment , Showers , Direct access to public transport , Gym and fitness centre close by , Impressive new fit out 150m to IGA East Brisbane 100m to Raymond Park and 170m to Mowbray Park 630m to the Gabba Sports Ground 2km from the CBD and 10 minutes from the Brisbane Airport 430m to the following bus stops 230,235 and N226 WHO IS OFFICE HUB? Office Hub has largest collection of shared office space, sublet office space, creative coworking office space and serviced offices, perfect for 1 200 employees. Let us take you on a tour of all the spaces that fit your needs and budget. Our service is complimentary and we work for you and the landlord to negotiate the most competitive deal in the market. Let us show you how shared and serviced offices can be the perfect solution for your business. www.office hub.com.au www.office hub.co.nz Conditions apply A portion of the square meterage factors in access to shared space. The advertised price includes any incentives offered based on a 12 month agreement. If a shorter period is agreed to please note the price may increase accordingly. This promotional offer for new tenants only and may be withdrawn at any time due to space availability. 322sqm office/ warehouse 122sqm office over two levels 200sqm warehouse 3 phase power 8 car spaces Rear 3 car spaces accessed via Biggs Street which could be used as 116sqm hardstand Dual roller doors Great access to local cafes, Public Transport, Brisbane CBD etc. Lease Price: $67,500 p/a + GST Gross ( approx.) For further information or to arrange an inspection please contact the marketing agents Jack Gwyn or Jared Doyle of Ray White Commercial TradeCoast! 557m² quality office and warehouse Solid masonry block construction Mixture of open plan and partitioned office areas Office space spans over two levels Boardroom Ample natural lighting throughout office Lunchroom and amenities Column free warehouse Warehouse accessed via one container height roller door Mezzanine in warehouse for storage Good internal height Six on site car parks 48 Manilla Street, East Brisbane is conveniently accessed off Lytton Road and located just 1.5km from the Brisbane CBD. Nearby amenities within 100m includes an IGA, chemist, multiple restaurants and cafés. Lytton Road provides users with exceptional access to the CBD as well as to the Port of Brisbane. For further information, or to book an inspection, please contact the marketing agents Ray White Commercial (QLD). approximately. 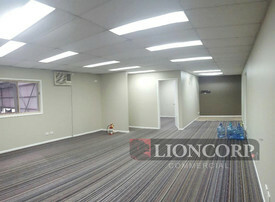 85sqm showroom/office space available on busy Lytton Road Ideal for office/ showroom tenants that benefit from exposure Last vacancy on site Locate your business on the main route linking Brisbane's luxurious eastern suburbs to the CBD Ample onsite car parking for staff clients Flexible leasing terms available Highly prominent corner tenancy Lease Price: $50,000 p/a + GST Gross (includes outgoings) ( approx.) For further information or to arrange an inspection please contact Jack Gwyn or Jared Doyle of Ray White Commercial TradeCoast! 51sqm showroom/retail/office space available on busy Lytton Road Perfect for pop up shops, start up businesses short term office/showroom users Locate your business on the main route linking Brisbane's luxurious eastern suburbs to the CBD Ample onsite car parking for staff clients Front and rear access to shops Shared toilet amenities Flexible short term leasing opportunities available Dual access from both car park and Street Lease Price: 24,000p.a. + GST Gross (includes outgoings) ( approx.) For further information or to arrange an inspection please contact Jack Gwyn from Ray White Commercial TradeCoast!